As a suicide attempt survivor, every day is an opportunity to make a difference and experience the extraordinary ordinary beauty that each day has to offer. I have been given a second chance, and I am not about to waste it. I dedicate every single day and as much time as possible to sharing my platform The Peyton Heart Project: Hearts for Hope and raising awareness for suicide prevention. Because I am a business owner and a title holder, everyday is different and holds new experiences. There is no ordinary day when it comes to being Miss State Capitol. Every morning starts off with a cup of coffee. Or five… Then once I am fully awake and functional I am ready to make Peyton Hearts. As a World Wide Ambassador for the Peyton Heart Project a big part of my job is making hearts. I have made over 4,500 hearts and have scattered 1,500 across four states. The process of making hearts is a great way to start the day. It’s a small task that makes a big difference. However, it’s no breezy walk through the park. It involves meticulously cutting heart outlines, wrapping tangled yarn around the heart until covered (my cat, Captain Charlie Claw loves to help with this part), cutting and attaching tags, and then scattering or mailing them to the project to be scattered all over the world. Service is a pillar on the Miss America crown, and to me the most important. I serve my community every single day. Whether is volunteering as a dance instructor donating all of my salary to Children’s Miracle Network, making hearts for the Peyton Heart Project, providing resources on The Peyton Heart Project’s national support group page, or helping raise thousands of dollars for America Foundation for Suicide Prevention, or attending the Kindred Cupcake Ball as their “Queen”. These are just a few of the ways I serve my community I help make a difference in the state of North Dakota. As a business owner, every day poses new experiences and opportunities. I opened Ava Hill Artistry after graduating with a Professional Media Makeup Artistry Degree at the age of nineteen and I am now an award winning makeup artist. I spend most days on set as a Key makeup artist for the film industry. I have had the opportunity to work on feature films, shorts, TV shows, commercials in North Dakota, Minnesota, and California. However, this job is not as glamourous as it sounds. Many days are spent at a desk breaking down scripts, writing invoices, scheduling, and sending copious amounts of emails to directors and producers. Speaking engagements keep me busy! I have spoken to over 1,500 students, sharing my story and raising awareness for suicide prevention. 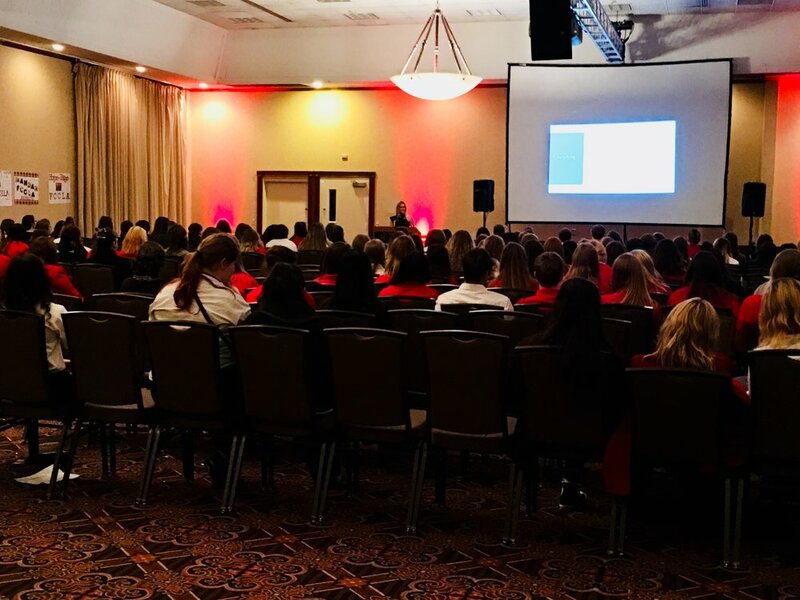 I speak to schools, community organizations, and even alongside Miss America at FCCLA State Leadership Conference! Speaking gives me the opportunity to not only share my story and provide resources, but allows me to create relationships with my listeners and provide comfort. Exercise is a huge part of my lifestyle, but nothing too noteworthy considering it is an everyday occurrence. However, my cat Debra would be disappointed if I didn’t mention our shared ab circuit and cardio. As a member of the film making community, I have a standing date with Netflix every night. I like to spend my evenings watching Supernatural or The Office and making Peyton Hearts. I mentioned that everyday is always different, but my start in end to every day remains the same. I begin and end each day by making hearts for hope as a reminder to be grateful for every extraordinary ordinary day as Miss State Capitol 2018.